The Alhambra in Granada, Spain is a magnificent Moorish fortress palace complex dating back to the 14th century. Avoid peak hours during the summer tourist season. Waiting lines can grow because the number of visitors allowed inside the Alhambra at any given time is limited. If you have to visit during the tourist season, arrive early or late - and avoid weekends and holidays. The Alhambra was constructed on a sheer-sided hilltop with commanding military-defensive views of the surrounding lands. 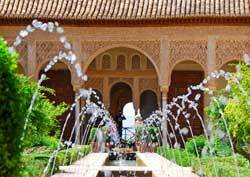 The Alhambra has many master-designed attractions including exquisitely ornate rooms, soothing fountain courtyards and aromatic gardens. No matter how grand the Alhambra is today, we'll never see it in its full glory. Time and war have long ago demolished some of the structures. The reddish clay on and around the hill gave the citadel its name - Alhambra means "red" in Arabic.